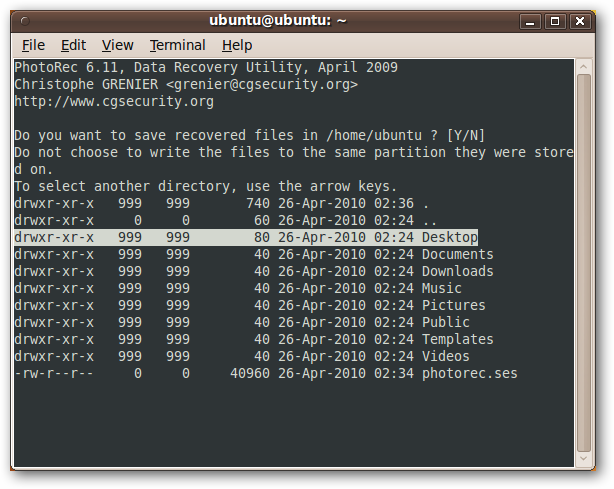 We’ve shown you simple ways to recover accidentally deleted files, even a simple method that can be done from an Ubuntu Live CD, but for hard disks that have been heavily corrupted, those methods aren’t going to cut it. In this article, we’ll examine four tools that can recover data from the most messed up hard drives, regardless of whether they were formatted for a Windows, Linux, or Mac computer, or even if the partition table is wiped out entirely. 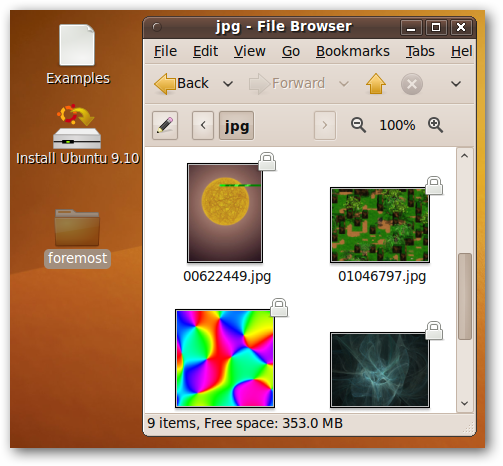 To show these tools, we’ve set up a small 1 GB hard drive, with half of the space partitioned as ext2, a file system used in Linux, and half the space partitioned as FAT32, a file system used in older Windows systems. 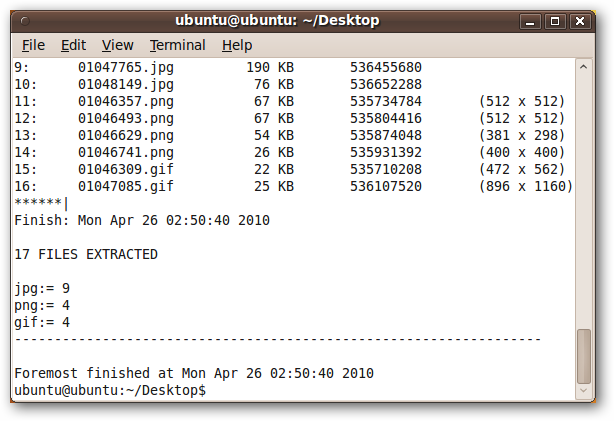 We stored ten random pictures on each hard drive. 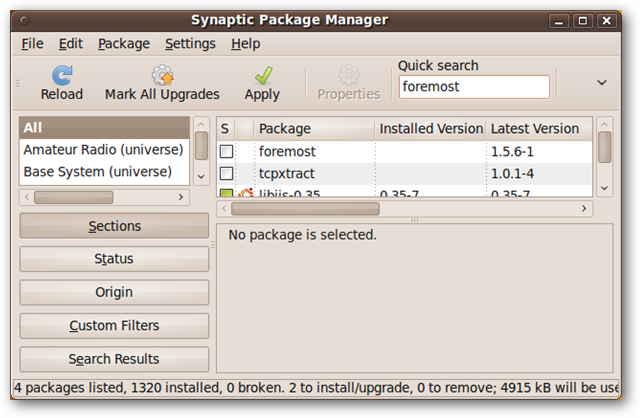 All of the tools we’re going to use are in Ubuntu’s universe repository. 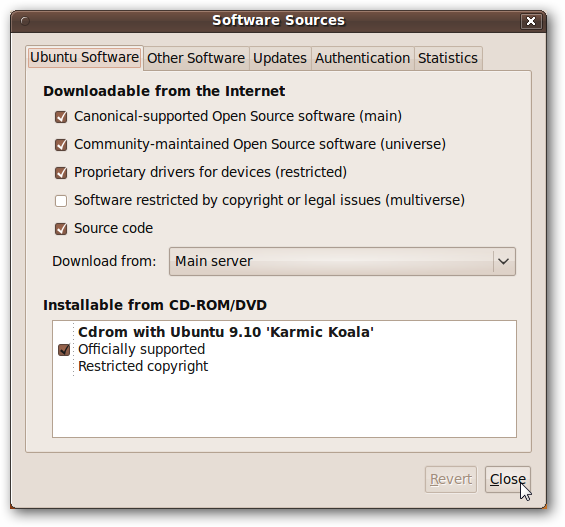 Click on Settings > Repositories and add a check in the box labelled “Community-maintained Open Source software (universe)”. If you can’t mount your hard drive, then its partition table might be corrupted. Before you start trying to recover your important files, it may be possible to recover one or more partitions on your drive, recovering all of your files with one step. 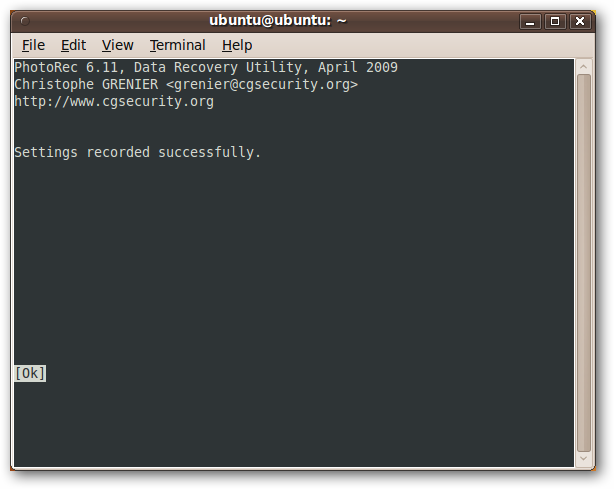 If you’d like, you can create a log file, though it won’t affect how much data you recover. Once you make your choice, you’re greeted with a list of the storage media on your machine. 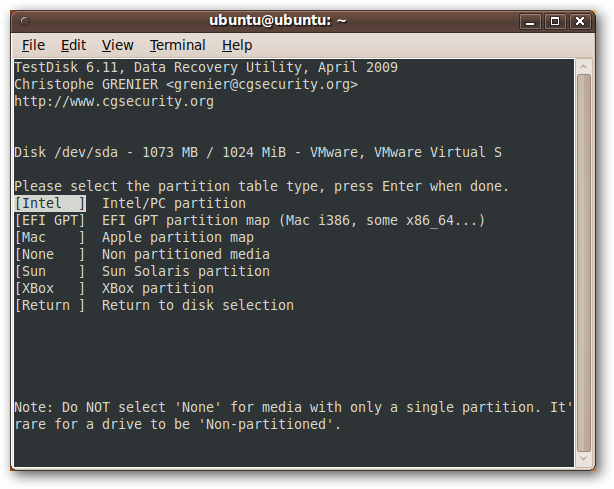 You should be able to identify the hard drive you want to recover partitions from by its size and label. 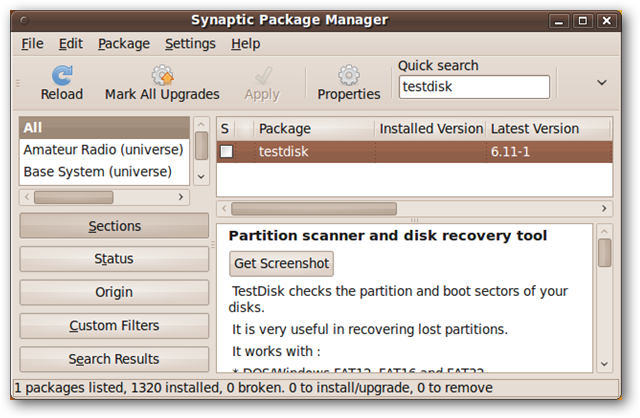 TestDisk asks you select the type of partition table to search for. In most cases (ext2/3, NTFS, FAT32, etc.) you should select Intel and press Enter. 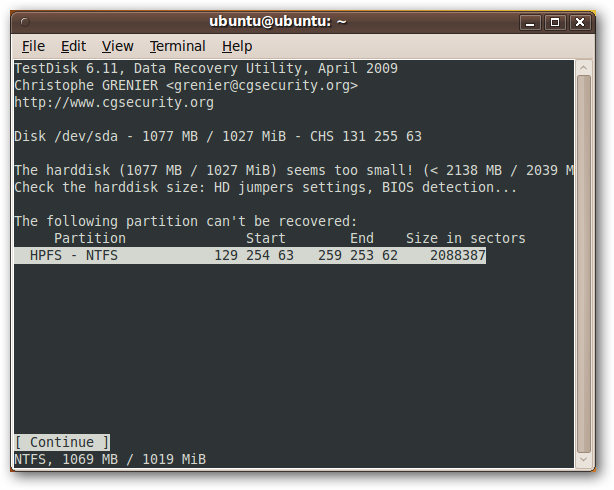 It also finds the two partitions we just deleted. We are able to change their attributes, or add more partitions, but we’ll just recover them by pressing Enter. 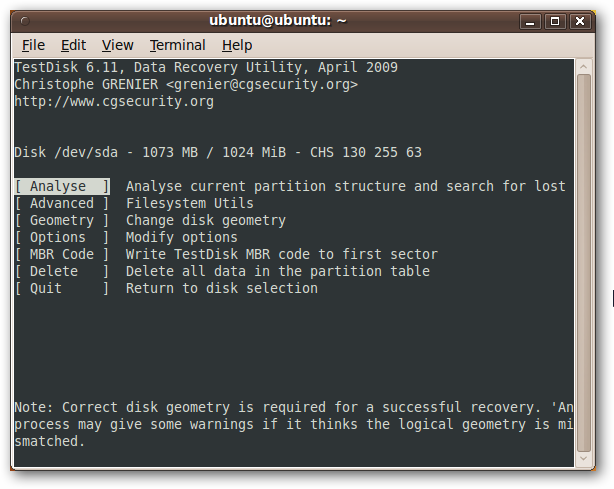 If TestDisk hasn’t found all of your partitions, you can try doing a deeper search by selecting that option with the left and right arrow keys. 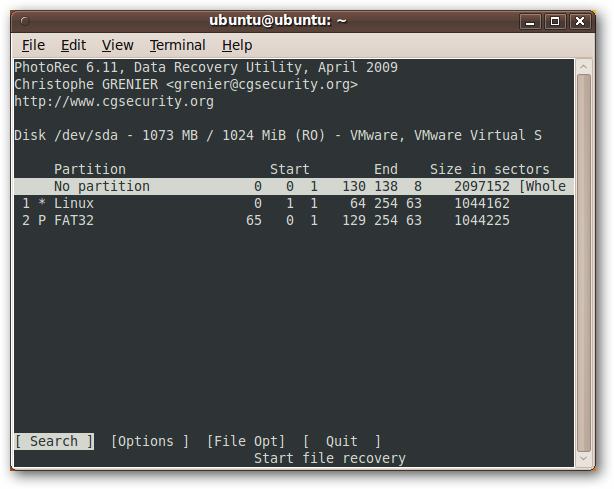 We only had these two partitions, so we’ll recover them by selecting Write and pressing Enter. 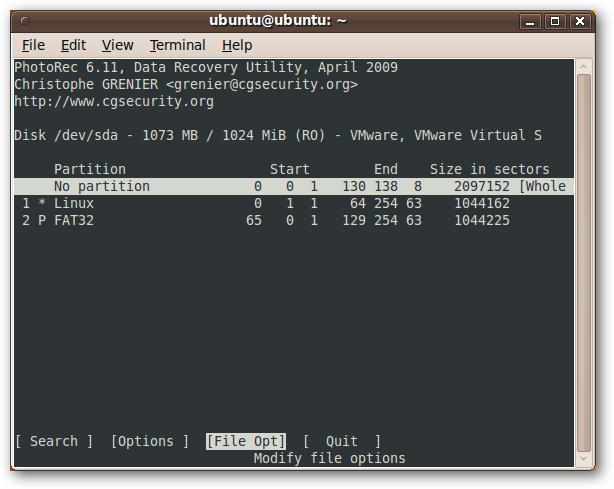 PhotoRec asks you select the type of partition to search. In most cases (ext2/3, NTFS, FAT, etc.) you should select Intel and press Enter. 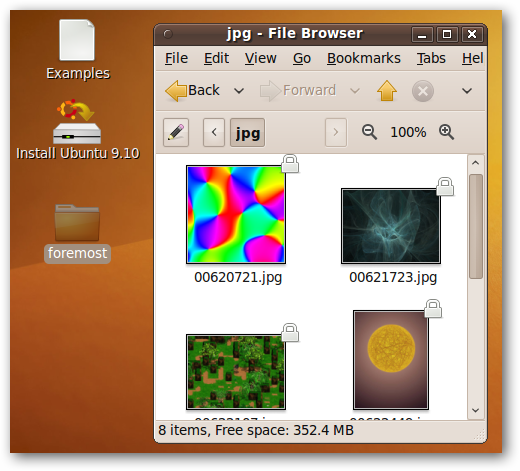 However, this process can be very slow, and in our case we only want to search for pictures files, so instead we use the right arrow key to select File Opt and press Enter. 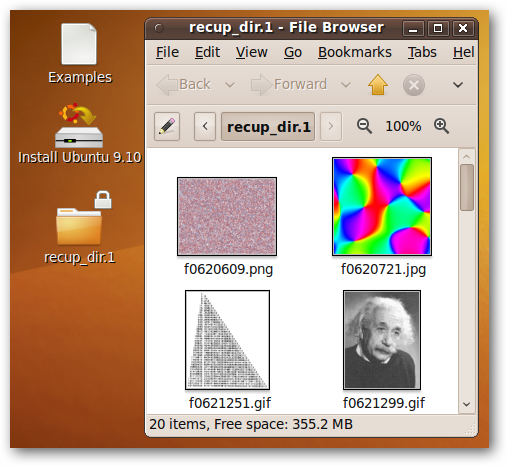 PhotoRec can recover many different types of files, and deselecting each one would take a long time. Instead, we press “s” to clear all of the selections, and then find the appropriate file types – jpg, gif, and png – and select them by pressing the right arrow key. Once we’ve selected these three, we press “b” to save these selections. 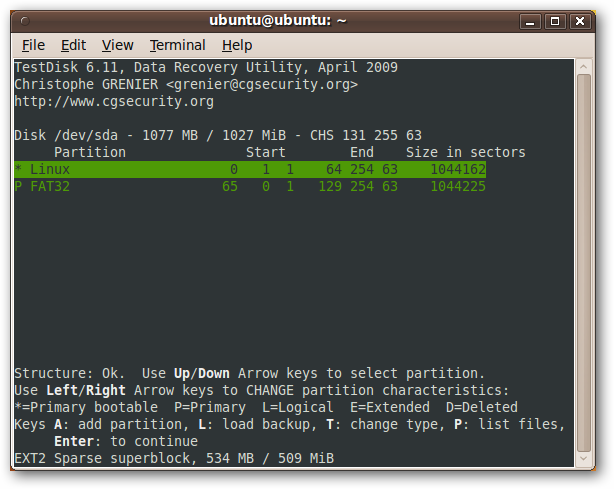 Press enter to return to the list of hard drive partitions. 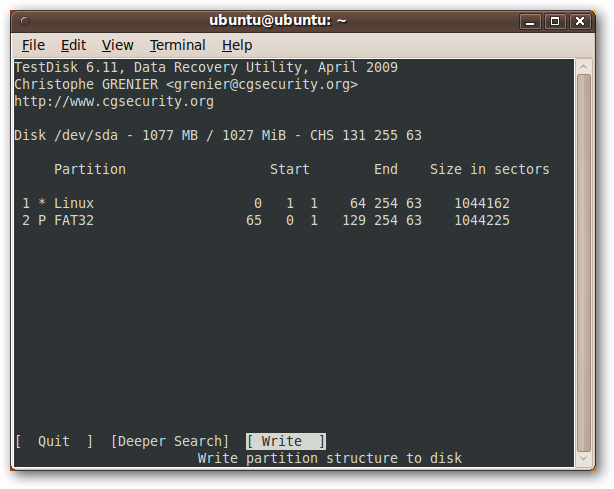 We want to search both of our partitions, so we highlight “No partition” and “Search” and then press Enter. 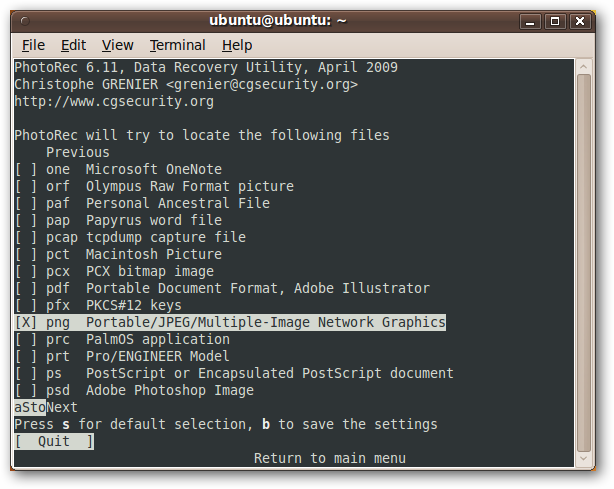 PhotoRec prompts for a location to store the recovered files. 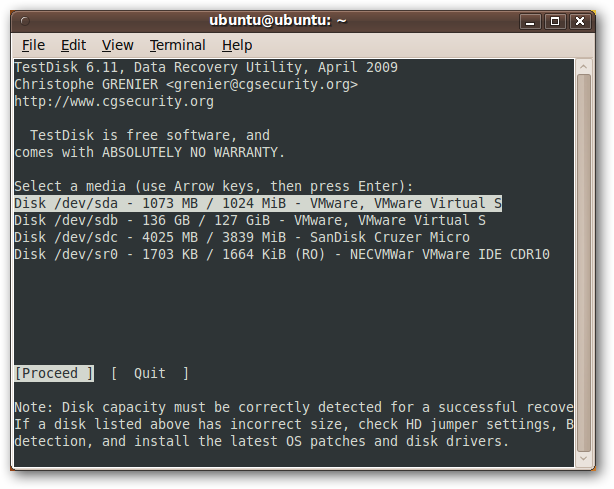 If you have a different healthy hard drive, then we recommend storing the recovered files there. 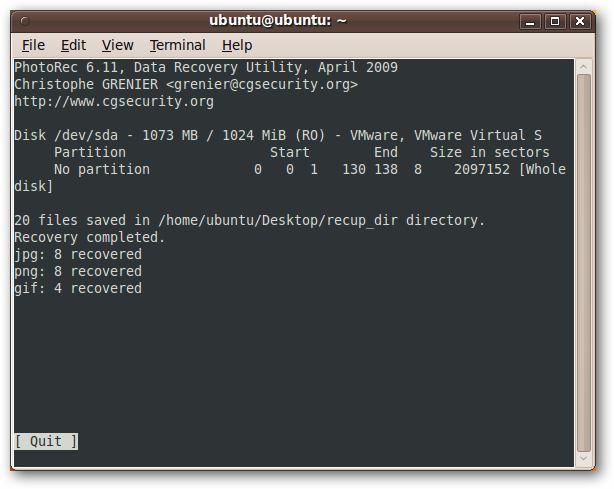 Since we’re not recovering very much, we’ll store it on the Ubuntu Live CD’s desktop. Note: Do not recover files to the hard drive you’re recovering from. -t, a comma-separated list of types of files to search for. 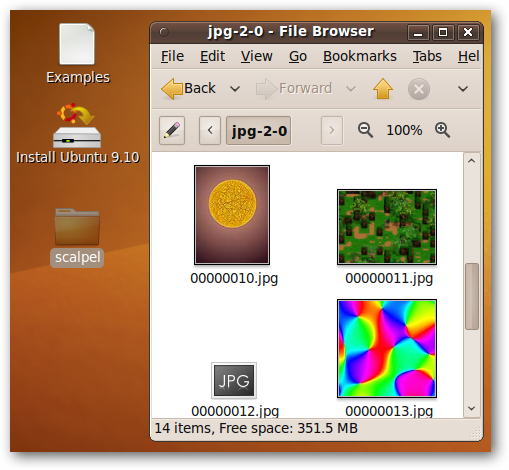 In our case, this is “jpeg,png,gif”. 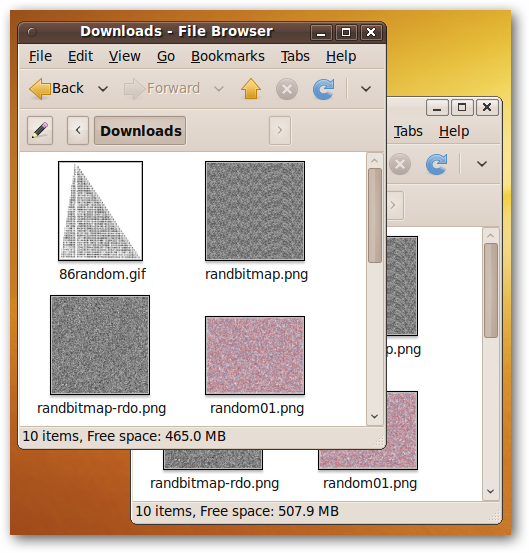 -o, the output folder to store recovered files in. 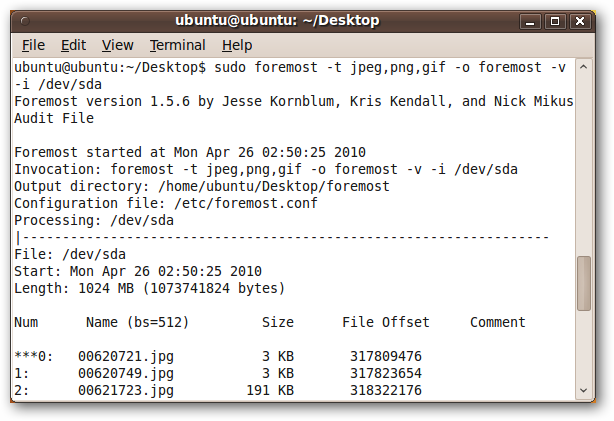 In our case, we created a directory called “foremost” on the desktop. Your invocation will differ depending on what you’re searching for and where you’re searching for it. 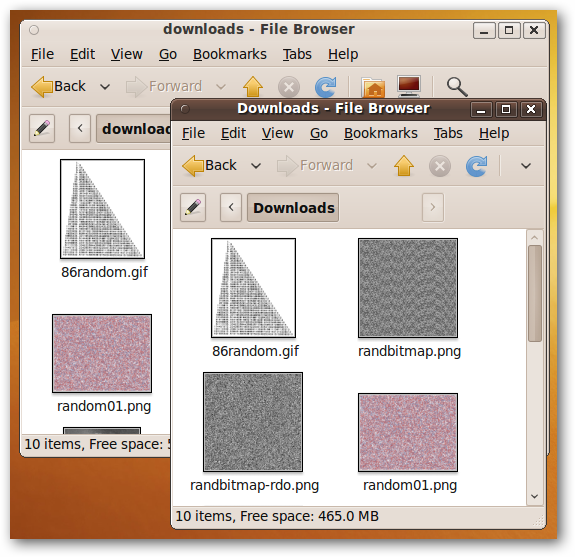 scalpel.conf contains information about a number of different file types. Scroll through this file and uncomment lines that start with a file type that you want to recover (i.e. remove the “#” character at the start of those lines). Scalpel also has a ton of command-line options that can help you search quickly and effectively; however, we’ll just define the input device (/dev/sda) and the output folder (a folder called “scalpel” that we created on the desktop). 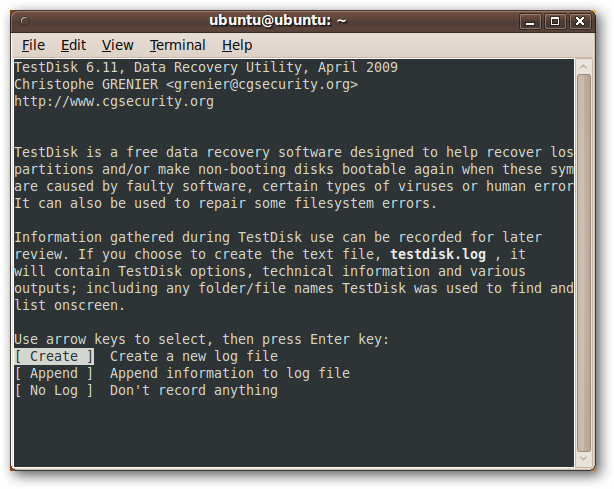 In our quick toy example, TestDisk was able to recover two deleted partitions, and PhotoRec and Foremost were able to recover all 20 deleted images. 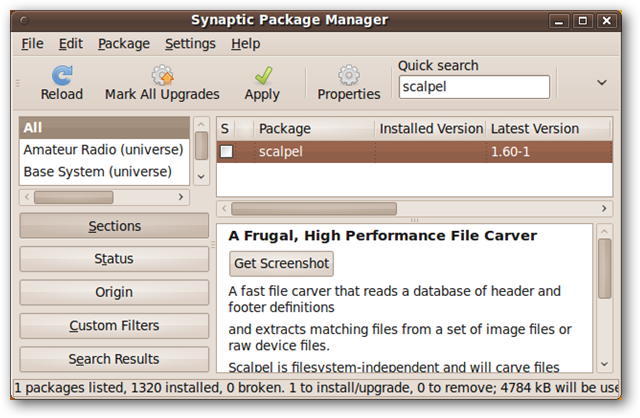 Scalpel recovered most of the files, but it’s very likely that playing with the command-line options for scalpel would have enabled us to recover all 20 images.